Oh, the holidays…so much going on, lots of parties, and way too many sweets! But c’mon, this rich chocolate cake is way too pretty to ignore. I spied this recipe on the Gourmet website and fell in love with the photo immediately. This cake screamed holidays and glamour and it’s nice to end a holiday meal with a bit of a spectacle. I made this as our dessert on Christmas day and the cake was moist but it was the bittersweet ganache that stole the show. Be sure to use a good chocolate for the frosting…I used a dark bittersweet chocolate from Callebault and it was amazing. A chocolate cake shouldn’t be fussy and this one is simple as it is stunning. The red dotty sprinkles helps to make this cake festive and gives everyone a reason to celebrate. And have I got a reason to whoop it up a little. The CBC has listed me as one of the “best of the food blogs”. Huzzah! 1. Preheat oven to 350. Butter and flour a round 9×2 cake tin or bundt pan and set aside. In a large small bowl, mix together dry ingredients (flour to salt). In a large bowl, mix together the butter and sugar until fluffy. Add in eggs, one at a time, and vanilla. Combine the milk and yogurt in a small bowl. Add flour and milk mixture alternating in batches, beginning and ending with the flour. 2. Pour batter into prepared pan. Bake until the cake pulls away from the sides of the pan, about 35 minutes. Remove from oven and cool slightly. Remove from pan and cool on wire rack. 3. While cake cools, bring the cream to a simmer in a small saucepan over medium heat. Add in chocolate and whisk until smooth. If the chocolate is too thick, add in a touch of extra cream. Stir in corn syrup and set aside to cool. Using a spatula, spread glaze over cake and decorate with sprinkles. Congrats! Your food blog is definitely my fave and your photo is better than Gourmet’s. you know I’ll love this one! You decorated it just perfect for the holidays. I’m sure this is delicious, but your picture is *perfect*. Happy new year! Oh my, this looks good! And congratulations on a well-deserved listing! Happy New Year! I look forward to more delicious recipes in 2009! congrats on the nod! You blog is my favorite! Love the cake, and congratulations! Happy New Year, here’s to good eatin’! that cake looks delicious! can’t wait to try it. question though – i didn’t see what should be done with the yogurt. should it be combined with the milk? What a beautiful cake – looks soooo rich and decadent! Perfect for a holiday meal! This cake definitely says “Celebration!” Congrats on being named a best food blog. Happy New Year! The cake looks great!! I mean c’mon it’s chocolate! The candy sprinkles are just the right amount of kiddie fun. The background paper is perfect for reflecting the sprinkles on the cake. What a perfect way to celebrate the new year. Hope you a have a great one!! p.s. congrats on being a CBC best food blog! Congrats! I did a chocolate cake w/ Christmas sprinkles this holiday, too! Yours looks perfect! That’s one great lookin cake! Happy New Year! I hope you celebrated with cake! That is one beautiful cake!!! It’s on my list of things to make! What a sweet end and new beginning this eternal circle of a cake represents! Happy 2009! Congrats! That is awesome and much deserved! What a pretty and yummy looking cake! Sounds like you had a good holiday season. I have given up the food blogging ( in rather dramatic fashion, I’m afraid – by removing my blog!) But I will still be reading food blogs…especially yours…now that it is CBC approved! thanks stefanie & a happy 2009 to you! happy new year, back at ya, sherri l! aw shucks, thanks & a merry 2009 to you, maven! thanks and happy new year crystal! not only is it pretty, it's pretty delicious too, pravina! sandy, oops, i've fixed that. just mix the milk & yogurt together and alternate with the flour! cookiepie, it was a perfect cake for a holiday and it would be perfect for any occasion…like a really great friday! thanks kevin, happy new year to you! lynn, thanks and let's make 2009 the year of celebrations!! thanks food librarian! it's definitely a worthy recipe. 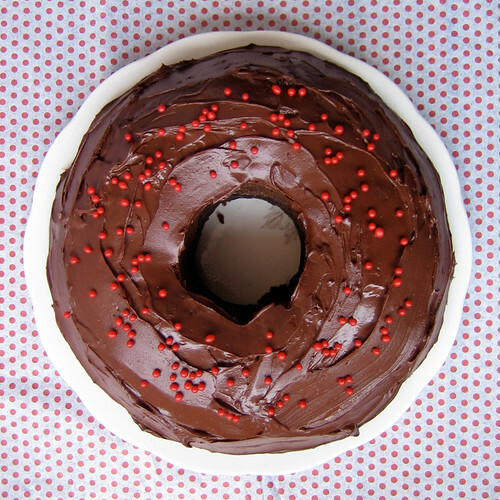 haha, cakespy, tis indeed the circle of sweet livin'! That really looks delicious. I’d like to invite you to take some time to drop by at Foodista and share this delicious recipe with us. We have launched an online food and cooking encyclopedia ala wikipedia. Add a recipe and you can win a $100 gift card to Sur la table. Don’t forget to register first so we know who to thank the recipe for. Thanks! Happy New Year!